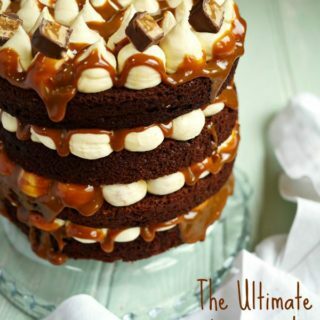 The mother of all layer cakes for any snickers or nut and caramel fans. With caramel sauce, marshmallow fluff, buttercream and soft sponge - it's a winner! Prepare your cake tins. I baked this in 4 lined 7" tins. If you only have 2 tins, just bake the batter in 2. It will take a little longer to cook, then slice each layer into 2 when cool. Cream your butter and both sugars until pale, light and fluffy. Add your eggs one at a time, beating well in between each addition. (Don't worry if it looks a little curdled. Gently stir in your flour to the rest of the batter until just combined. Finally, stir in your yoghurt and vanilla extract. Share between either 2 or 4 tins. If using 4 tins and you want to make each one even, there should be about 375g of batter in each tin. Don't make this batter and leave it hanging around before putting into the oven. The baking powder will begin to react straight away, so whip it into the oven quickly. Bake for about 20-25 minutes in 4 tins, or 35-40 minutes in 2 tins. This will really vary a lot though depending on your oven. So just check regularly towards the end of the cooking time. As soon as the cake 'pulls' away from the side of the tin, is springy to the touch and a skewer comes out clean, it's done. Beat in the marshmallow fluff. Stir through the peanut butter, I like to not quite mix it all in, so that you get a bit of a marbled effect. When the cake is completely cold, level each cake with a serrated knife. (Just slice the top off.) This is really important, I promise it's not a waste of cake. With a whopper this size, if each layer isn't level there's no chance of it staying upright. Snip about 2cm off the end of your piping bag and holding the bag full of icing about 3cm above the cake, pipe teardrop shapes. Put your caramel into another piping bag, snip about 0.5cm off the end and drizzle over and around the icing. Repeat for each layer. For the top layer, always use an uncut side of sponge facing up so it doesn't dry out. Finish off with slices of snickers bar.